AI Crypto is a game-changing project that finds identity in an innovative blend of Artificial Intelligence (AI) and Blockchain technology. It began as an initiative to help individuals counter the towering barriers to entry in the AI market, with a robust founding team that consists of individual experts boasting over a decade's worth of experience in the field. Based on their technical expertise, the AI Crypto team has been developing a decentralized ecosystem where AI resources such as Graphic Processing Units (GPU), Model and Data are distributed, enabling any person with an interest in developing AI applications to participate at an unbelievably reasonable cost. Apart from their primary activity in developing a decentralized ecosystem, the AI Crypto team has also seen notable achievements in connecting AI and mining with GPUs. The experts on board understand that GPUs are necessities beyond just cryptocurrency mining; they are crucial elements in enabling AI deep learning. With that, immense time and resources have been invested into creating a cutting-edge technology that will serve as the cornerstone to connect mining and AI deep learning with GPUs, all within the Blockchain. Studies have proven the monstrosity of the AI deep learning and GPU rendering markets at present and its exponential growth is not showing any signs of stopping. Unfortunately, profits from mining remain as slim as ever, generating only approximately $0.15 per hour with a single GPU. Cost also raises an issue, with an excessively high burn rate of $1 per hour just for GPU usage. In addition, the disparity between mining profits and developer fees stand at a whopping 60 times; an unsurmountable figure that is simply incomprehensible. With a vision to provide larger profit to miners and cheaper costs for developers, the AI Crypto team kick-started the world's first initiative to distribute GPU processing technology to mining pools. Its flagship feature – an AI multi-mining function – allows the GPUs to mine even when deep-learning training requests are unavailable. With AI Crypto, anyone will be able to develop their very own AI applications at a reasonable cost, regardless of their ability to afford access to high-performance GPUs. 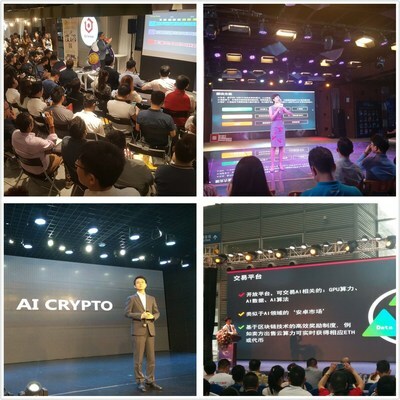 AI Crypto prides itself in its advantageous position within a tight network of established corporations, including Bitforex - the leading exchange in terms of the size of trading volume, AEMI - a mining pool of over 100,000 high-performance GPUs as well as Shinhan DS Inc. – a partner firm cooperating with AIC for AI Mining technology. Just recently, AI Crypto signed an MOU with Shinhan Bank and Bitforex, forging a promising relationship with the heavyweights. The AI-blockchain project is also rumoured to be in the process of negotiating venture capitalist deals in Singapore and China. Participants of the AI Crypto ecosystem will be using its staked token, AIC, based on the ERC-20 and ERC-721 standard. Noteworthy dates include AI Crypto's ICO closing date on 30th September 2018, as well as an exciting listing on Bitforex on 5th October, 2018. Contributions to the project are only accepted in ETH.